Located on the northwestern coast of the island of Sicily, the city was founded by Ancient Greeks and eventually became part of the Roman Empire. In the ninth century, the Arabs took over and converted churches to mosques and the common language to Arabic. The Norman period followed, and in the 13th century Palermo was the capital of the Holy Roman Empire. The French and Spanish later passed through. Today, while Sicily is officially part of Italy (the regional government is semi-autonomous), its capital city of one million residents feels neither European nor Arabic, but some combination of the two. The city was heavily bombed by Allied Forces during WWII, and some neighborhoods have yet to be repaired. 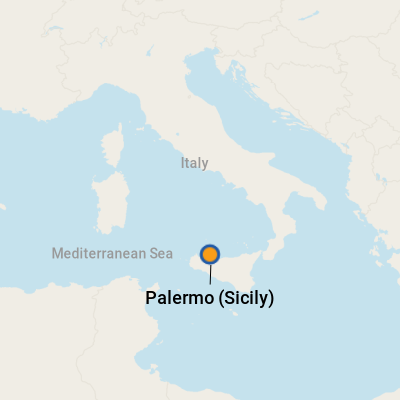 More recently Palermo has made headlines as the base of the infamous Cosa Nostra (mafia). To be sure there are rich neighborhoods (check out the shops on Via Liberta, Palermo's Rodeo Drive) and poor neighborhoods, sometimes on the same street. If you wander just a little off the beaten path you will find streets that just don't seem safe even in broad daylight (visitors are advised not to wear flashy jewelry and to keep close watch on their cameras, pocketbooks and wallets). You dock at a modern pier, within walking distance of downtown. In the terminal building are a cafe, convenience store and, on the second floor, a Western Union office with Internet access. The traffic is truly crazy. Use caution when crossing major thoroughfares. As mentioned above, leave your valuable belongings on the ship or guard them carefully. Cabs and horse-drawn carts offering tours can be found just outside the terminal gates. In either case it is wise to negotiate a price up front. Cabs can be hired by the trip or hour. Double-decker tour buses operate around the city. Public buses run around the city and to the suburbs as well. While this is a good walking city, and you can easily walk to dining, museums and shopping, be aware the old part of the city is a jumbled warren of streets and it's easy to get lost. Also be aware, pickpockets are particularly skilled in Palermo. The local currency is the euro. Most banks have ATM's. There are also individual ATM's throughout the city. On our last trip we dined on seafood pasta at Sapori Perduti, a restaurant that was surprisingly hip and gourmet for being located on a downtrodden-looking side street (Via Principe di Belmonte) -- male models were sitting at the next table. The venue features new, albeit a little pricy, Sicilian cuisine. Open for lunch and dinner. At Bar Alba (Piazza Don Bosco, off Via Liberta, Tuesday - Sunday, 7:30 a.m. until 11 p.m.), where you can sample arancine (Sicilian rice balls stuffed with meat and peas and fried) and cassata Siciliana (the Sicilian version of fruit cake). Colorful hand-painted ceramics, embroidered fabrics and coral jewelry (coral is considered a fertility symbol).